In addition to the previously reported sprucing-up of Massachusetts Hall’s systems (“Building Unabated,”  May-June, page 24), the Stadium’s concrete walls and steps underwent repairs, beginning this spring, that are scheduled to conclude before this fall’s football games; fans will find that the seats have gotten an overdue power washing. And the “HBS Commons” took form, as the Business School prepared to commission Klarman Hall and repurpose the space formerly occupied by Burden Hall, yielding a new open quad, pavilion, and outdoor gathering area that will complement meetings and conferences at Klarman, scheduled to be available for use by this fall (see “Klarman Construction,”  March-April, page 18). An interdisciplinary Quantitative Biology Initiative, supported by the president’s office and the Faculty of Arts and Sciences, aims to apply expertise in biology, mathematics, statistics, and engineering to explore fundamental questions about the behavior of biological systems. The faculty leaders are Vinothan Manoharan, Wagner Family professor of chemical engineering and professor of physics, and Sharad Ramanathan, Gund professor of neurosciences and of molecular and cellular biology, and professor of applied physics and stem cell and regenerative biology.…And the Kennedy School’s Belfer Center has launched a Project on Europe and the Transatlantic Relationship; the faculty chair is Nicholas Burns, Goodman Family professor of the practice of diplomacy and international relations. Pierre Berastaín Ojeda ’10, M.Div. ’14, has been appointed director of the office of sexual assault prevention and response, overseeing advocacy, education, prevention services, and coordinating throughout Harvard.…Gene Corbin, assistant dean of the College for public service, who has served in that position after previously leading Phillips Brooks House, stepped down in May; he is pursuing a doctoral degree at the University of Massachusetts Boston.…With dean of freshmen Thomas Dingman’s planned retirement at the end of the academic year (see harvardmag.com/dingman-18 ), Harvard College dean Rakesh Khurana announced the consolidation of that office and the Office of Student Life under the direction of current dean of students Katie O’Dair, in an effort to integrate undergraduate programming throughout the four years of residence; a full report appears at harvardmag.com/fdo-osl-merger- 18 . The University’s annual tax filing and disclosure of compensation, released each May, reveals that Harvard Management Company’s most senior real-estate investment manager, Daniel Cummings, earned $23.9 million (including $12.3 million vested based on his age and years of service), during the latest reporting period. (He and his unit have since transferred from HMC to Bain Capital, part of the restructuring of endowment management). President Drew Faust received total compensation of $1.533 million, including retirement and deferred compensation and nontaxable benefits (the latter principally for use of the Elmwood residence). Details are available at harvardmag.com/earnings-18 . As renewal continues for a second full year of construction at Lowell House, the Faculty of Arts and Sciences has outlined a three-year renovation sequence for Adams House, which comprises seven buildings spread across three blocks. 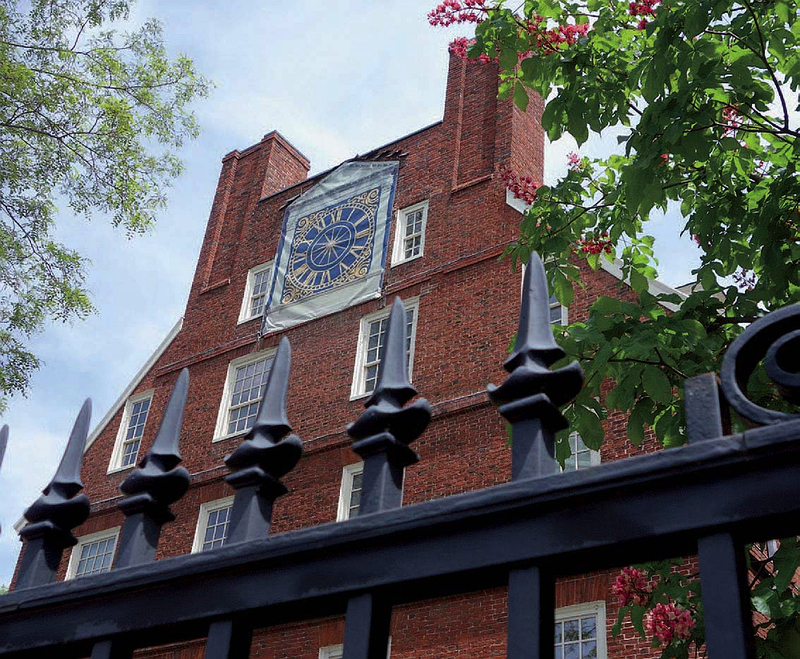 Beginning next year, Claverly Hall and Senior House will be redone, reopening in August 2020, to be followed by Randolph Hall and Apthorp House (reopening August 2021) and then Russell Hall, the library commons, and Westmorly Court (reopening August 2022). Brown University announced a $100-million gift from alumnus Robert J. Carney and Nancy D. Carney for its brain-science institute, which will be named in their honor.…The University of Michigan medical school received a $150-million gift to fund research and training at its cancer center; it will be renamed to honor donors Richard Rogel and Susan Rogel (they are the university’s second-largest individual donors).…Columbia’s Vagelos College of Physicians and Surgeons, drawing on a $150-million gift received last year, has eliminated the loan portion—often $30,000 or more per student per year—in its students’ financial-aid package; beginning in August, medical students who qualify for scholarships will have their full need met without borrowing.…The University of Pennsylvania, which concluded a $4.3-billion Making History capital campaign in 2012, has launched its successor, The Power of Penn, aiming to raise $4.1 billion—its second fund drive under President Amy Gutmann.…The Blavatnik Family Foundation, let by Len Blavatnik, M.B.A. ’89, which underwrote Harvard’s “biomedical accelerator” with gifts totaling $55 million (see harvardmag.com/blavatnik-13 ), is deepening its commitment to translating medical advances into applications at Yale, too; the Blavatnik Fund for Innovation there, initially seeded with $10 million in 2016, has received an additional $15-million gift. Essays envoi. Harvard College will no longer require applicants to submit the essay portion of the SAT or the ACT. Although the application still entails writing an essay, the writing part of the standardized tests is now optional. School studies. The College and the Graduate School of Education are creating a new secondary field in “educational studies,” debuting this fall. It echoes other nonprofessional secondary fields, in areas like global health and architecture studies (see “Architecture as Liberal Art,”  January-February 2015, page 22), that give undergraduates a structured way to pursue their interests by drawing on the expertise of other faculties. Senior legal counsel. William F. Lee, senior fellow of the Harvard Corporation and a litigator at WilmerHale, has assumed the role of lead trial lawyer representing Harvard in the lawsuit brought against its admissions practices by Students for Fair Admissions, which is challenging affirmative action. The case has been characterized by prolonged discovery and disagreements about what, if any, records will be made public; it may proceed to trial this fall. The University noted that Harvard does not compensate Lee for his work on the matter, and he recuses himself from associated Corporation deliberations. Online outpouring. While HarvardX continues to offer massive, open online courses for free, and professional schools pursue revenue-generating classes, the real action appears to be at the Extension School. In reporting next year’s offerings to the Faculty Council in mid April, its dean, Huntington Lambert, noted that of 878 courses given during the academic year just ended, two-thirds were online, 71 of which incorporated intensive weekend sessions on campus. Memorial Marathon. Most Faculty of Arts and Sciences meetings begin with abbreviated Memorial Minutes on the life and services of deceased professorial colleagues. On May 1, Baird professor of science emeritus Dudley R. Herschbach did the honors four times, seriatim, honoring chemists Konrad E. Bloch (d. 2000), Eugene G. Rochow (2002), Leonard K. Nash (2013, whom historian of science Thomas Kuhn ’44, Ph.D. ’49, JF ’51, thanked in his first book for a “vehement collaboration”), and William A. Klemperer (2017). President Drew Faust rightly thanked Herschbach for this “Memorial marathon.” No one noted one Nobel co-winner (Bloch, 1964) being memorialized by another (Herschbach, 1986) from the same department. D.B.A. redone. At its May 1 meeting, the Faculty of Arts and Sciences unanimously approved Harvard Business School’s proposal that the former doctor of business administration (D.B.A.) degree be transformed into an interfaculty Ph.D. in business administration, consistent with similar degrees in business economics, organizational behavior, and health policy and management. Policing perspective. In the wake of the controversial arrest of a black undergraduate by the Cambridge police department in April, and community concerns about the degree of physical force applied, President Drew Faust on April 30 announced a review committee, chaired by Annette Gordon-Reed, Warren professor of American legal history and professor of history, to determine the sequence of events that evening, the response of University police and health services, and opportunities “for improvement across a range of institutional activities,” including policy matters, mental health, and community policing. A report and recommendations are expected by the fall semester. Miscellany. Parag Pathak ’02, Ph.D. ’07, JF ’09, who studied applied math in the College and earned his doctorate in business economics, and now professes downriver at MIT, has been awarded the American Economic Association’s John Bates Clark Medal, granted annually to the leading economist under age 40.…Mark Lee, professor in practice of architecture and founding partner of Johnston Marklee, has been appointed chair of the Graduate School of Design’s department of architecture.…Lorraine Daston ’73, Ph.D. ’79, of the Max Planck Institute for the History of Science, in Berlin, has been awarded the $1-million Dan David Prize, in recognition of her foundational work on what she called the “ideas and practices of rationality,” the basic categories of scientific investigation (reason, proof, data, and so on).…Jesse D. McCarthy has been appointed assistant professor of English and of African and African American studies; while completing his doctoral studies at Princeton, he profiled novelist Colson Whitehead  and black-studies theorist Fred Moten  for this magazine (September-October 2016 and January-February 2018, respectively).